Hasan Shehata was no doubt one of the best, if not the best coach in the Egyptian national football team's history. Only being appointed as manager in 2004 (after the sack of Italian Marco Tardelli) he has led Egypt to winning the last three editions of the African Cup of Nations. No other manager in football history has led a country to winning their continental title three times consecutively. Shehata resigned shortly after drawing at home against South Africa, shattering Egypt's lifeline of qualifying to next year's edition of CAN. He was already under tremendous pressure for failing to qualify the pharaohs to the World Cup the year before; and of course for being a supporter of Hosni Mubarak. 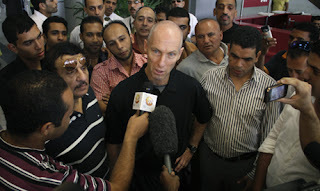 After a host of names were linked to the Egyptian post (including former Ghana boss Milovan Rajevac) ironically the one hired was American, Bob Bradley. The former head coach of the USA's national team and a few MLS clubs before that has been confirmed to take charge of the pharaohs. "I’m very happy and proud to coach Egypt, which boasts many talented players" Bradley told the Egyptian media yesterday after finalizing his contract details with EFA chairman Samir Zaher. Is now the best time for an American to take charge in Egypt? Probably not, but hopefully Egyptians will focus on judging Bradley's contributions and views strictly on the pitch. Bob Bradley also had an impressive stint on the international level with the US. He won the 2007 CONCACAF Gold Cup on home soil before leading the USA to the final of the 2009 Confederations Cup in South Africa losing 3-2 against Brazil. In that same tournament his team thrashed an Egyptian side 3-0, after Egypt’s impressive displays against Brazil and Italy. He also managed to guide his team to the 2010 World Cup in South Africa, getting knocked out in the round of 16 to Ghana after squeezing through the group stage. The USA sacked Bradley after losing 4-2 in the latest CONCACAF Gold Cup final to Mexico. Bradley has stated that he is determined to qualify Egypt to the 2014 World Cup in Brazil, no doubt if he doesn't succeed in this task he will not be spared more time, unlike Shehata. Bob knows the potential of the pharaohs, "The Egyptian player is a talented one unlike the American who depends mainly on his fitness." If he can inject discipline, organization and competition into the squad then Egypt may very well become a revolution to world football, not just Africa.